This content was published: June 3, 2014. Phone numbers, email addresses, and other information may have changed. Story by Becky Olson and Janis Nichols. It’s undeniable that Ursula K. Le Guin is a literary powerhouse. She’s also a local legend, an inspiration to writers of all levels, and a really cool lady. Winner of a National Book Award, a Pushcart Prize, and countless other accolades, her best known fantasy works, the first four Books of Earthsea, have sold millions of copies and have been translated into 16 languages. Her first major work of science fiction, “The Left Hand of Darkness,” is considered epoch-making for its radical investigation of gender roles and its moral and literary complexity. At a public reading on May 20 at the Cascade Campus, Le Guin read a short selection from both her fiction and nonfiction, spoke with English faculty members Blake Hausman and Tanya Pluth in a structured Q & A, and took questions from the audience. With queries ranging from how she tackles writer’s block (“don’t read anything for a week”) to more nuanced questions about specific books published early in her career, Le Guin dished her answers out with wisdom and wit. 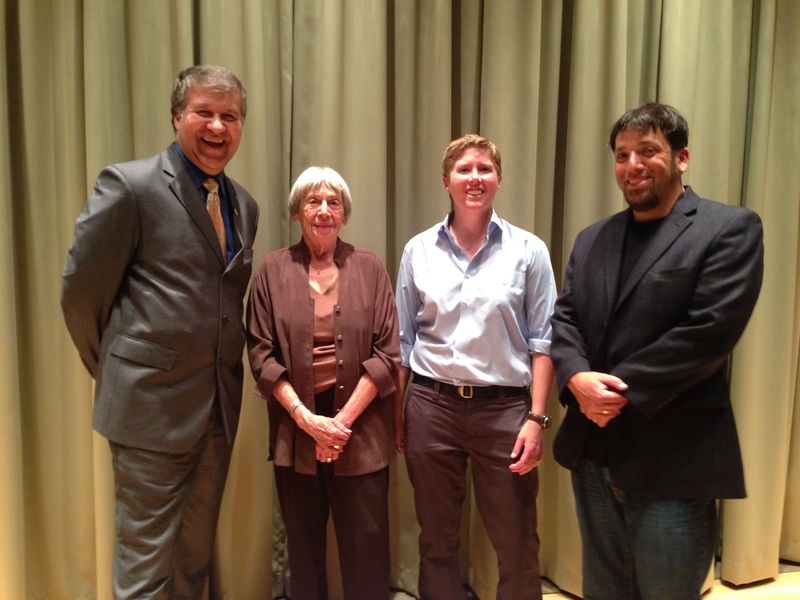 Ursula K. Le Guin with President Jeremy Brown and faculty members Tanya Pluth and Blake Hausman. Although Le Guin has lived in Portland for almost fifty years, this was her first visit to PCC and she said she loved the campus. When she was given one of those unmistakable PCC umbrellas at the end of the visit, she wielded it in one hand above her head like a wand–not unlike a wizard of Earthsea herself. “I’m pinning my hopes for the future of education on community colleges,” the author said. A teacher of writing herself for many years, Le Guin’s daughter also teaches literature on the English faculty at PCC. Learn more about Ursula K. Le Guin’s background and which PCC classes discuss her work here. For 90 minutes on May 22, everyone wanted to be Ursula LeGuin. Everyone wanted her staggering writing skills, her wit, her compassion and her experience. The Portland resident ended her two-day PCC engagement with a standing-room-only crowd in the Event Center at Rock Creek Campus. She began by reading “Some Approaches to the Problem of the Shortage of Time” from her 1982 book “The Compass Rose.” It was appropriate for the science fiction writer to begin her conversation with a parody of science writing followed by an hour of questions from future writers. At age 84, LeGuin clearly enjoys exchanges with young people and was both encouraging and respectful. “Young people take to science fiction writing because young people are aware the world doesn’t have to be the way old folks made it,” Le Guin said. The conversation ranged from the profound to the humorous. here’s a snippet of what was discussed. Can we be hopeful (about our future) because of technological advances? Le Guin: A technological fix will not get us out of the hole we have dug for ourselves. It can help going forward—when we consider solar versus fracking for example. We need to dig deep and change our mindset about what we expect from our world…big question, no answer. Are your first drafts as crappy as mine? Le Guin: After 40-50 years you gain skill in the craft. Writing is a skill and it’s learnable. First draft problems…If you’re still interested in a piece after it’s been sitting around for a while, go back to it. Le Guin: Every writer is different. Write when you find the time. If you work eight hours a day, it’s incredibly difficult. Most writers write two to three hours at once. It’s very intense. We are methodical about where to write. I have to be there waiting for it. I have to wait it out sometimes. Le Guin: When my older brother taught me to write at age 5. Writing comes to me the way music comes to a musician. Le Guin: I wanted to. Where do you get your ideas for a story? Le Guin: The story doesn’t start with an idea. I find a person or place I want to talk about. Art is a very mysterious phenomenon. We don’t know much about where it comes from. I’m not that curious about it. If water is running from the spring, I don’t care where it’s coming from. What advice to you give writers? Le Guin: Read. Read about what you want to write. When writing science fiction, how do you know how much (detail) is too much? How much detail do you give the reader? Le Guin: When writing fantasy, the reader knows little about the world you are telling them about. Grind up information and scatter it throughout the story and allude to it but don’t describe it. If the information advances the story, it won’t do any harm. Realism is so much easier. What changes do you see in science fiction writing? Le Guin: Science fiction is being looked at not as something for engineers, but as literature. All the critical walls are crumbling. Science fiction as a separate way of writing has run its course. Technology has caught up and gotten far ahead. I haven’t given up on it, but it’s changing fast. May we have a writing prompt? Le Guin: Write a page or two of prose without using any adjectives or adverbs. It’s a chastity exercise. Took my teen daughter (a sci-fi nut) to hear her at Cascade, and she was absolutely delightful! Her readings were mesmerizing and she clearly enjoyed engaging with the audience and answering questions. What a smart, sharp and engaging lady!